LaBELLE, Fla. — Doctors treating a Florida boy, who has a rare form of meningitis, have been told about an experimental breast cancer drug and the dramatic drop in body temperature that helped make an Arkansas girl the third survivor of this affliction. The Centers for Disease Control and Prevention in Atlanta confirmed Tuesday that there has been communication between the doctors treating the two youths. Kali Hardig, 12, has been a patient at Arkansas Children’s Hospital since shortly after a mid-July swimming trip to a water park and was diagnosed with a case of primary amoebic meningoencephalitis. Zachary Reyna, 12, was knee boarding in a water-filled ditch near his family’s LaBelle, Fla., home August 3rd when he contracted the same infection. He is in the intensive care unit at Miami Children’s Hospital, where his family is keeping vigil at his bedside and hoping he becomes the fourth survivor. The infection destroys brain tissue and is almost always lethal— the fatality rate is more than 99 percent. The CDC said one of 128 individuals with the infection in the U.S. in the past 50 years has survived; and one in Mexico survived. Dr. Jerril Greene, pediatric critical care specialist and co-medical director of the Pediatric Intensive Care Unit at Arkansas Children’s Hospital, said there were several measures implemented and a couple of critical actions taken for Kali that probably led to her survival. “The first thing we did was to cool her down so she no longer had a fever,” said Greene, who was Kali’s physician. Kali was brought in with a high fever and doctors were concerned about the threat of brain swelling. “Be patient — it takes baby steps.”— Traci Hardig, mother of Kali Hardig, said. Greene said the pressure in her brain was constantly monitored, and her temperature was as low as 91.4 degrees. “It was mainly therapeutic,” he said. “We do that for other diseases where pressure is a concern such as encephalitis and in traumatic brain injuries.” However, Greene said the organism involved, Naegleria fowleri, thrives in a warm environment and was probably inhibited by the drop in body temperature. Greene said that use of an experimental breast cancer drug and a cocktail of anti-fungal and antibiotics were factors in Kali’s survival. “Miltefosine is a cancer drug,” he said. Greene said other actions also gave Kali a fighting chance. “Her mom and dad got her here quickly, and the people who saw her in the emergency room recognized they needed to be more aggressive,” he said. Greene confirmed that Kali was amoeba-free, and that she was in rehabilitation. The CDC confirmed that the Miami hospital contacted Kali’s doctors to discuss their treatment. Traci Hardig, Kali’s mother, also said that the two families have been in touch. 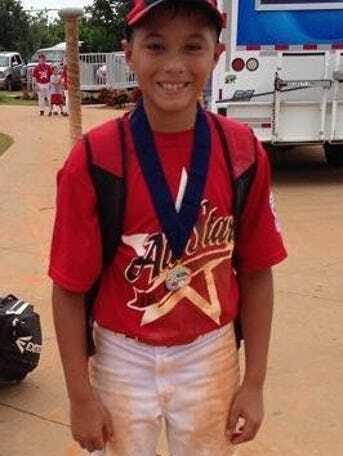 Zachary Reyna, 12, has been active in sports. (Photo: Courtesy of Reyna family). She said that the two families are in constant contact via e-mail, text or phone. “I talked to Zachary’s brother, Brandon, and to his grandmother. They said Kali is really giving them hope,” Hardig said. Zachary is now more than two weeks removed from the onset of symptoms. The CDC said that death from the infection can come anywhere from one to 12 days. Meanwhile, Kali continues to improve, her mother said. “Her nausea has gotten better, and she’s doing physical therapy,” Hardig said, adding that Kali has been tossing a ball back and forth to therapists, has moved her legs and wrote her name. Hardig said doctors treating her daughter said there was no longer a question of whether Kali will survive and do well. Dr. Vikki Stefans, one of Kali’s rehab doctors, said via e-mail that Kali has been able to take a few steps with help. “She can make some sounds and approximate a word or two and clearly understands a lot more than she can speak. She follows many verbal commands and can move everything,” said Stefans. Stefans said some areas of Kali’s brain appear to have been affected, but it is less widespread and less severe than is seen in a lot of actual traumatic brain injury survivors who do well. “By doing well, we don’t necessarily mean everything just 100 percent perfect like nothing ever happened; we often see people go back to school and activities working harder to do what used to come easily for them, and having to use a lot more determination and effort to do it,” she said. Hardig said Kali struggles to attempt speech and can make sounds to communicate. Any progress at all is cause for a celebration, she said. “It’s like you just want to jump up and scream,” she said.